Providing your four-legged family member with the best quality products so that you can ensure that he is living his best life possible is your goal as a pet parent. You’ve made sure that he has the most supportive dog bed so that he can be comfortable as he snoozes. He has a spacious outdoor dog kennel where he can enjoy exercise for those times you can’t take him on walks. He has a variety of toys to play with, including puzzle toys for dogs and interactive dog toys, to keep him amused. In other words, you’ve taken care to ensure that your pooch has the best of everything. But of all the products you choose for your four-legged family member, the type of dog food you feed him is the most important. After all, if your pooch isn’t eating a well-balanced diet that offers him the nutrients he needs, then he isn’t going to thrive, and his health can suffer greatly. At first glance, selecting a type of food for your furry pal might not seem like a complicated task; but, once you realize how many different options are available, you might find that finding the perfect food is a bit overwhelming. There is a wealth of dog food brands, and just as many formulas; from wet dog food to dry dog food, and from dog food for allergies to grain free dog food. In fact, the number of options can leave you feeling pretty dizzy! While there are many brands to choose from, there’s one brand that countless pet parents have been trusting for decades: Iams dog food. If you’re thinking about feeding your pet Iams, but you aren’t sure which recipe to choose, or you are simply wondering “Is Iams a good dog food?” Then you’ve come to the right place! 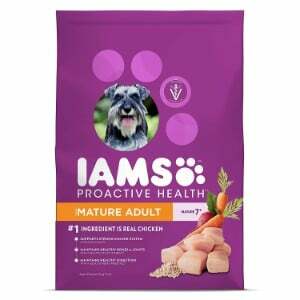 In this review, we share our picks for the top five formulas from this trusted manufacturer, and share some insight on the Iams pet food company. Now that you’ve seen our choices for the top Iams dog food formulas, let’s take a closer look at each one. Below, we offer a more detailed description of each product, including the ingredients that they contain, what we like about them, why we consider them to be the best that this manufacturer makes, and what pet parents who have used these recipes have had to say. After you read through the reviews and choose an option that you think will best meet the needs of your pup, click on the buttons to find the best prices currently listed on Chewy and Amazon. 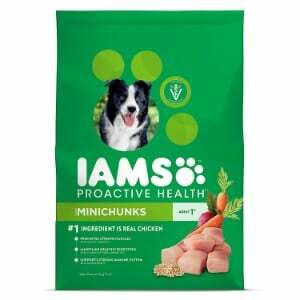 First up on our list of the best Iams dog food formulas is their Proactive Health Adult Mini Chunks Dry Dog Food. This dry dog food recipe is specifically designed to meet the nutritional needs of adult dogs of all shapes, sizes, and breeds. It contains real ingredients, is infused with essential nutrients, and is highly recommended by veterinarians and animal nutritionists. The first ingredient featured in this formula is protein that has been sourced from farm raised chicken. It offers the protein that adult dogs need to thrive, as it helps to support their joint health and potentially prevent the development of issues like hip and elbow dysplasia; conditions that many breeds are predisposed to, like Great Danes, Mastiffs, Saint Bernards, and even smaller dogs, like Dachshunds. Wholesome grains and fresh veggies, like carrots, tomatoes, spinach, and green peas, are easy to digest and can help to prevent upset tummies. These ingredients are also packed with essential vitamins and minerals that adult dogs need to thrive. Infused with a variety of nutritional supplements, such as vitamin D, B vitamins, copper, manganese, potassium, and Omega 6 fatty acids, round out the ingredients listed in this dry dog food. This Iams dog food is designed to maintain healthy metabolism, boost cardiovascular health, improve the health of your dog’s skin and coat, and promote stronger muscles. In other words, it offers well-balanced nutrition to ensure your adult canine companion can maintain a happy and active lifestyle. And it even helps to improve the health of your canine’s teeth, as the crunchy kibble scrubs off plaque and reduces bad breath, too! Since the kibble is smaller, it can easily be consumed by pups’ that have petite mouths, making it a great food for small dogs. Final Verdict: By feeding your adult canine companion Iams Proactive Health Adult Mini Chunks Dry Dog Food, you can ensure that he will receive the very best nutrition for his overall health and well being. Made with premium ingredients and perfectly balanced with the right blend of vitamins and minerals, this is an excellent choice for adult dogs. If you have a mature pup, then it’s important to feed him a specially formulated senior dog food. As canines age – just like humans – their nutritional needs change. They are more prone to certain health conditions, like digestive disorders, diabetes, cardiovascular disease, and joint problems that can lead to reduced mobility. Iams fully understands the needs of mature dogs, which is why they created their Proactive Health Senior Dry Dog Food. This formula features real chicken as its primary source of protein; however, the first ingredient in this formula is whole ground corn, which some pet parents may question. Traditionally, protein is featured as the first ingredient in a high quality dog food; but Iams decided to use ground whole corn instead in order to make this kibble easier to digest. That’s important for senior dogs, as digestion can slow and digestive health issues can arise as a pup ages. It also contains prebiotics and beet pulp, which help to support digestive health. So, in essence, this can be considered a dog food for sensitive stomachs. This Iams recipe is also formulated with a wealth of supplements that have been hand-selected to support health issues that are common among mature canines. L-carnitine, for example, helps to maintain metabolism, which naturally slows as a pet ages, and will therefore assit your pet with burning fat and maintaining a healthy weight. The kibble is also designed to support your pooch’s dental health, as it is super crunchy and basically acts like a toothbrush, scrubbing off plaque and tartar buildup as your pet chews. Final Verdict: With Iams Proactive Health Senior Dry Dog Food, you will be able to keep your mature pooch in tip-top condition. This formula is specifically made to meet the nutritional needs of aging pups and support their overall health and well being. Just like young humans, young canines need to receive the right blend of vitamins and nutrients to ensure that they are developing properly. 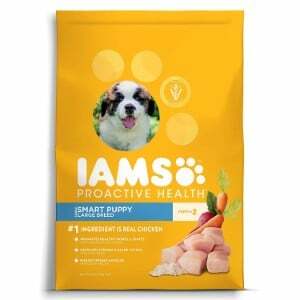 Iams Proactive Health Puppy Dry Dog Food is specifically formulated to provide puppies of all breeds and sizes with the nutrition that they need during this extremely important developmental stage. What really sets this formula apart from other dog food formulas that are made for puppies is that it features 22 key nutrients that are a canine mother’s milk contains. As such, it can essentially be considered a puppy milk replacer (however, it should only be consumed by dogs whose teeth have developed enough to safely consume the kibble; 6 weeks or older) Some of the nutrients this recipe offers include DHA, which helps to support brain development, which is vital for puppies. It also offers nutrients that help to strengthen the immune system, as well as the bones, muscles, joints, and teeth. And since the ingredients are easy to digest, it’s easy on the sensitive tummies of young pups. It also features real chicken as the first ingredient for optimal protein, and a variety of fruits and vegetables, like green peas, apples, blueberries, spinach, carrots, and tomatoes. The majority of pet parents who feed this food to their puppies say that they are very happy with the product and that it is very easy for tiny mouths to tackle the small kibble. Final Verdict: To ensure that your growing puppy is getting the nutrition that he needs, consider feeding Iams Proactive Health Puppy Dry Dog Food. Featuring all of the nutrients that puppies need to thrive, you can rest assured that your little furry family member will get the nutrition that he needs for proper development. If you are interested in feeding your canine companion a diet that consists of natural ingredients, then Iams Health Naturals Dry Dog Food is an excellent option to consider. Since it contains natural ingredients, it offers complete balanced nutrition. It also has the perfect proportion of proteins and fats, which are sourced from real, premium quality chicken, to ensure your pooch’s palate is pleased and that his dietary requirements are met. In addition to real chicken, this formula also contains a wealth of fresh fruits and natural veggies, such as dried beet pulp, apples, and blueberries to provide a fuller flavor that will better appeal to your pet’s taste buds. The real fruits and vegetables five this formula plenty of vitamins, minerals, and nutrients; however, to further ensure that it meets the nutritional needs of your furry best friend, this formula is also infused with high quality supplements. Antioxidants help to boost the health of his immune system, vitamin E and vitamin D helps to nourish his skin and coat, and calcium promotes stronger bones and teeth. It’s also completely free of artificial flavors, colors, and preservatives, so you can have confidence knowing that your pet will be getting all of the good stuff that he needs and none of the unhealthy stuff that he doesn’t. Final Verdict: If you are looking for a natural food option for your canine companion, Iams Health Naturals Dry Dog Food is an excellent formula to consider. Made with all natural ingredients, completely free of artificial flavors, colors, and preservatives, and featuring easy to digest carbohydrates, this recipe will keep your pooch – and you – satisfied. If your dog has dental health issues and has difficulty eating dry kibble, or he’s just finicky and refused to eat dry food, then feeding him a high quality wet dog food is an excellent choice. Since wet food has a softer, meatier texture than dry food, and it is usually more flavorful, many canines find that it is much more palate pleasing. Iams Proactive Health Wet Dog Food is made with high quality ingredients to not only keep your pup happy, but to keep him healthy, too. Made with premium quality animal proteins, and infused with a wealth of vitamins and minerals, this canned food formula will keep your pup’s muscles and joints healthy and strong, and also enhance the strength of his immune system. It features omega 3 and 6 fatty acids to improve the health of his skin and make his coat more lustrous. Wholesome grains, like brown rice, barley, oatmeal, and flaxseed, are easy to digest and will offer your pet the carbohydrates that he needs to support his energy levels. Final Verdict: Iams Proactive Health Wet Dog Food is a premium quality canned food that dogs of all ages and sizes will love. Not only does it offer balanced nutrition, but it also offers a taste that most dogs can’t resist. Making sure that your furry best friend receives the best possible nutrition to meet his dietary needs is the most important thing that you can do. After all; if he isn’t getting the nutrients that he needs, he isn’t going to thrive. There are tons of dog food brands on the market, like Wellness dog food, Merrick dog food, Natural Balance dog food, and Taste of the Wild dog food; but, while these brands offer premium quality ingredients, they also tend to be high priced. If you don’t want to spend a fortune on feeding your four-legged family member, but don’t want to sacrifice his nutrition, then you might want to consider feeding him Iams dog food. Iams dog food was created by Paul Iams, an avid animal lover. Mr Iams wanted to create food products for dogs that would meet their nutritional needs without breaking the budget of pet parents, which is why he created Iams. This manufacturer has been around since 1946 and it is one of the most well known dog food brands in the world. This company is highly regarded for using high quality animal proteins and other premium ingredients to meet the dietary requirements of dogs of all ages, sized, and breeds. 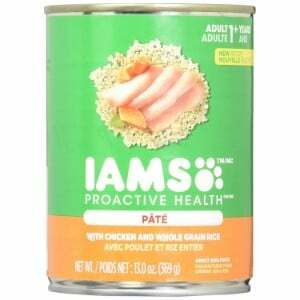 In 1982, the Iams company was purchased by Clay Mathile, who has further improved the reputation of the company by creating products that pet owners can trust. For dog owners who are interested in providing their furry friends’ food that is specially formulated to meet their dietary needs without costing an arm and a leg, Iams is a great choice. This dog food manufacturer offers a variety of formulas that are customized to provide balanced nutrition for dogs of all ages, sizes, and breeds. They create two different formulations: Healthy Naturals, which contains all natural ingredients and is free of artificial flavors, colors, and preservatives; and Pro Active Health. Both formulations are also free of wheat and soy, making their foods an excellent choice for pet parents whose dogs may suffer from allergies or food sensitivities, or who simply don’t want to feed their furry pals’ these ingredients. But, it is important to note that a lot of their recipes do contain corn, which is gluten-based product; however, if your dog can tolerate gluten, then he shouldn’t experience any problems. All Iams recipes are specifically formulated to meet the needs of animals. They also comply with the most stringent pet food regulations, and adhere to the recommendations that are made by animal nutritionists and veterinarians regarding the nutrition that dogs need. As noted, Iams does offer a wide variety of dog food recipes. So, with so many choices, how did we narrow down the field and choose just five? We enlisted a panel of experts, which include animal nutritionists and veterinarians. We wanted to find the best formulas for dogs of all ages, sizes, and breeds to ensure that all pet parents could find options that would work best for their particular pooch. With that said, our panel of experts helped us analyze the ingredients offered in the different Iams recipes to determine which options would best meet the needs of puppies, adult dogs, and mature dogs. 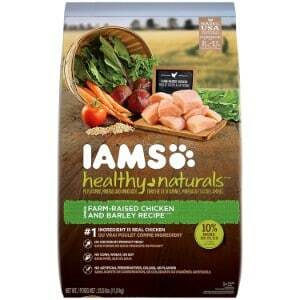 We also read through dozens of Iams reviews that pet parents shared about these products. Based on our analysis, we were able to narrow down the choices to the five recipes featured on our list. Feeding your pet a high quality dog food is vital for his overall health and well being. While there are many dog food brands to choose from, Iams is among one of the most trusted on the market. Offering premium quality proteins, a variety of nutrients, and a wide range of recipes that are specifically formulated to meet the needs of all dogs, you can rest assured that your dog will receive the best possible nutrition when you feed him Iams.